Back in the 1960s, the rock and roll generation led a cultural revolution—and we’re about to do it again. This next revolution will upend stereotypes on aging and create a whole new paradigm for life after 50. -The rock and roll generation is different from any other. Unlike the previous generation, whose memories of the Great Depression and World War II left them worried about the future, we’ve always been creative, optimistic, unafraid of change, and young at heart. We believe the best is yet to come. -The term "senior" belongs to our parents' and grandparents' generation. We’re the rock and roll generation—always have been, always will be. 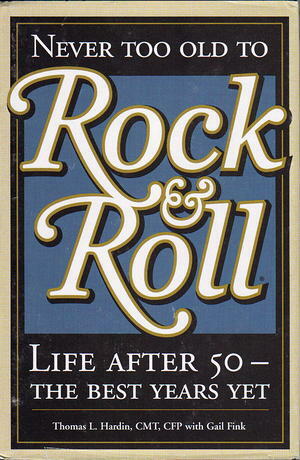 When we’re 100 years old, we’ll still be the rock and roll generation! We’ll never consider ourselves “seniors,” no matter how old we get. -We’ll attack our 50s, 60s, and 70s much differently than our parents did. Thanks to advancements in technology, medicine, nutrition, and other key areas, we feel younger physically and mentally, and we won’t slow down anytime soon. -We’re living a lifestyle we love and we don’t want it to end. Rather than “retiring” to inactivity, we feel like kids out of high school—every choice, career, and opportunity is ours for the taking, and this time we have wisdom, insight, intuition, and money! -Attaining financial freedom is more important than ever. With so much to look forward to, we don’t want to run out of money before we run out of time. If you believe that getting older means struggling to live within your means, falling apart at the seams, and giving up on your dreams, this is not the book for you. But if you want to make life after 50 your best years yet—if you’re looking for new ideas, new concepts, and new adventures—then get ready to rock and roll! This book will change the way America looks at aging, now and forever.